No matter where we live, none of us are immune to disasters. We all need to have an emergency plan for when disaster strikes — and that plan should include our dogs and other pets. Put a rescue alert sticker in your window so emergency workers know there’s a pet inside during a fire or other disaster. If you evacuate with your pet, write “evacuated” over the sticker if you have time. Pack a disaster kit for the whole family, including enough pet food and water for five days, a leash and waste disposal bags. Include a photo of your pet, too, in case you get separated. If your pet spends time alone outdoors, bring him inside at the first sign of a storm or disaster. Left alone, a frightened or disoriented pet may run away during a crisis. 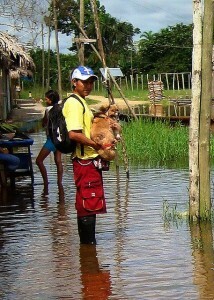 If you have to evacuate, take your pet with you. If it’s not safe for you, it’s not safe for him. Take a comfortable pet carrier, large enough for him to stand up, because he may have to stay in it for hours at a time. Plan ahead where you will board him if he’s not allowed in an emergency shelter. Your veterinarian and local animal shelters may have suggestions. Make sure your dog has an identification tag, including your cell phone number. Ideally, he should also have a microchip, in case he slips his collar. If you’re waiting out an emergency at home, keep your pet and disaster kit with you in the safest room in your house. That may be a room away from windows during a tornado or a room upstairs or with high counters during a flood. For more suggestions, check out these excellent resources from ASPCA and the Humane Society of the United States. My neighbors recently purchased a trampoline for their children. Soon after they assembled the trampoline, my kids asked if they could jump. They were very surprised with my response. Although many parents may see the trampoline as a fun and engaging way for their children to exercise, the potential for serious and catastrophic injury should make you think twice about this activity. My neighbors were trying to convince me that the trampoline was a safe activity, especially with the protective netting. While the netting does reduce the chance of being thrown off the trampoline, it doesn’t make it safe. The truth is, most injuries occur due to collisions with other children, landing improperly, or landing on the side rail. You’ve heard the expression, “what goes up, must come down,” and due to the laws of physics, the higher a child jumps, the harder the impact. The National Electronic Injury Surveillance System estimates that 98,000 trampoline-related injuries occurred in 2009, the most recent year for which statistics are available, resulting in 3,100 hospitalizations. About 75% of trampoline injuries occur when multiple people are jumping, with children age five and under at greater risk for significant injury. That risk increases when you have a small child jumping with older children. Fractures and dislocations make up 48% of injuries. Common injuries in all age groups include sprains, strains, and contusions. However, severe, life-altering injuries such as spinal cord and neurological damage can occur. Many people just don’t recognize the risks, or even the liability, associated with having a recreational trampoline. 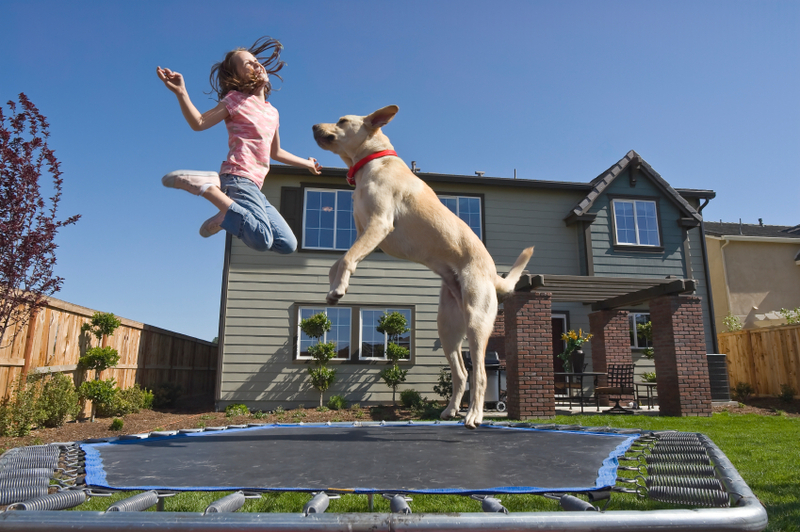 Most home insurance policies have trampoline exclusions, charge a higher premium, or mandate that they are within enclosed areas with restricted access. And let me be clear: I’m referring to backyard trampolines; not those in gymnastic centers under direct supervision and coaching or the small indoor models used for core-toning. Children under 6 years of age should not be allowed to jump. Only allow one jumper at a time. Allow no somersaults or tricks. Jumping should always occur under direct supervision of a competent adult who is willing to enforce and moderate the trampoline rules. Do not be lulled into a false sense of security just because a trampoline has safety nets or other protective equipment. As you can guess, my answer was a firm “NO” to my children. As parents, we have to make some unpopular choices. But providing a safe, loving environment where our children can grow into healthy adults is our most important role. Do you have a trampoline? What’s been your experience? For more on this topic, see this article. This entry was posted on Friday, August 2nd, 2013 at 8:11 am and is filed under Central, Home, Liability, Personal, Safety Tips. You can follow any responses to this entry through the RSS 2.0 feed. You can leave a response, or trackback from your own site. Driving Text Free – There’s An App For That! I’m on the road pretty much every day for work and there’s not a day that goes by that I don’t see a distracted driver texting away as they are driving down a busy highway. 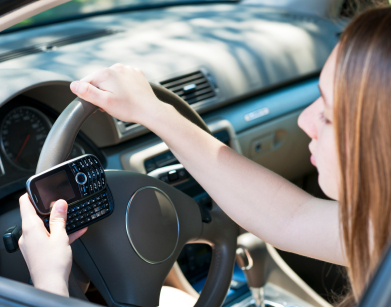 The statistics about distracted driving are alarming. The number of deaths due to distracted driving is expected to exceed those from alcohol-related accidents by 2014. Yet no matter how many awful statistics we hear, it just doesn’t seem to help solve the problem. Whether you’re a concerned parent or a business owner with a fleet of vehicles, you want to keep your family or employees safe when they are on the road. That leads me to one of my favorite modern-day questions: do they make an app for that? The short answer is YES, there are several apps to help us stay safe on the road. What’s available basically falls into three categories. The first category I’ll call “The Honor System.” These apps let you voluntarily lock your phone in a safety mode while driving. They have a variety of tracking plans that will allow you to award your teen or employee for choosing to do the right thing. These apps will promote good behavior but will not always eliminate the risk. The second category I’m calling “I Just Can’t Do It.” These are mainly apps that help you avoid texting in variety of ways, from automated responses to messages that tell the sender you’re busy driving, to one button pre-programed responses and other hands-free texting assistance. The third category I’m calling “Eliminate the Temptation.” These apps literally eliminate the ability to text while driving. Your phone is locked and can’t be used while driving with the exception of calling 911 or receiving a hands-free incoming call. This one can be used for a family or fleet. It helps stop texting while driving by allowing you to set up “no cell zones” that limit cell phone use based on specific locations and times. It has both an annual payment option and a monthly option starting at $6.99 per month. Available for most Android phones, this app disables the texting option while driving. If anyone tries to disable or uninstall the application, you are notified. It appears to be one of the more cost-effective at $29.99 annually, but review scores are low so you may want to check it out in more detail before signing up. This one is for both family and fleet. It uses a small, easy to install device inside the car to detect movement and stop the use of cell phones. It’s starting price is $89.99, but appears to do the job. This one is designed for the business auto fleet owner. The functionality and tracking components would seem to be a fleet manager’s best friend. However, like most of the fleet options, you need to call for pricing. The next time you are tempted to send a text while driving or see someone else texting behind the wheel, remember…there’s an app for that! This entry was posted on Friday, September 6th, 2013 at 10:17 am and is filed under Auto, Central, Personal, Prevention, Safety Tips, Technology. You can follow any responses to this entry through the RSS 2.0 feed. You can leave a response, or trackback from your own site.